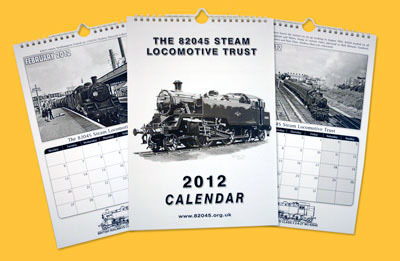 We've commissioned a calendar for 2012 - it is A4 black and white with twelve images of the 82xxx's in their working days - from Southampton through the West Country into Wales and at Waterloo. The calendar is only £5.00 + £1.00 p&p and is available from Barbara. Please email to reserve a copy before sending a cheque as stock is now very limited! We have placed the order for pattern making and casting of the cylinder assemblies with Cerdic Foundries Ltd. of Chard, Somerset who have previous experience of this type of work. We are very grateful to the Severn Valley Railway Association for running a raffle on behalf of the cylinder aspect of 82045's construction and the magnificent response from the membership. We have trial fitted the backing plates to the horn blocks for the centre axle and begun welding the manganese liners to the backing plates. Quite a lot of work still to do in this aspect of the chassis. Work continues on the footplating around the front area of the chassis. The Shortest Day has just come to an end as I write these notes: always a symbol of hope as we start the long haul back towards the light. Roll on! Still on an optimistic note, I am also able to report very positively on 82045's year. Despite the dreadful start to the year when our copper was stolen, we have enjoyed a year of consistently excellent progress which culminated in the completion of the chassis; the splendid response to the Autumn SVRA Raffle; and the placing of the order for the locomotive's cylinders at the beginning of December. For a more detailed (and expert) overview of engineering progress - which is, after all, the most interesting part! - please see Tony's monthly Engineering Notes. At the time of writing, we are awaiting the call from the SVR for the chassis to go into the Boiler Shop for riveting. The date we were provisionally given was November, but for reasons beyond anyone's control this has now been put back to the New Year. The good thing about it is that we should at least be under cover for the remainder of the winter. Working parties have met regularly throughout the year, generally on Mondays but also with a subsidiary working group often meeting mid-week. In addition to the regular gang, we have been delighted to welcome recently-retired SVR fitter Brian Malyon and Trust members Martin Managhan and David Struckett, who have brought their respective skills to bear on the locomotive. On many occasions this year it has been possible to see up to ten people hard at work at our site and in the Bridgnorth workshops: an indication of the level of interest in the project. The value of such a degree of volunteer input, whether skilled or unskilled, cannot be overstated. While this is very difficult to quantify, it has undoubtedly allowed us to stretch our finances to absolute maximum effect, and I believe that the 82045 project may well benefit from a greater level of volunteer involvement, leading to less reliance on the cheque-book, than is the case with most of the current new build schemes. Many thanks to all concerned for giving freely of their time and expertise. In addition to the engineering front, a huge amount of work has been going on in the background in order to ensure that the project remains on the soundest of footings. Membership Secretary Barbara Massau has continued to keep immaculate records. Numbers are nudging a very pleasing 400 as the year ends, but we will be making earnest attempts to raise this figure in the New Year. The response to the SVRA Raffle indicates a good deal of latent support amongst the wider membership of the SVR, and we must make every effort to tap into this, bearing in mind though that there are many other worthwhile projects on the Railway that are competing with us for funds; and also that people are having to watch their pennies in these difficult economic times. A fraction of just one banker's bonus would see 82045 completed, but we'd better not go down that particular road! If any of you out there are not yet members of the Trust - or if you know anyone who might be interested in joining us - please do your best to help us ensure that this most practical and much-needed of new build locomotives can take to the rails at the earliest possible date. Looking forward over the next twelve months, I can report that our finances are in good order and that the funding is in hand to pay for the chassis to be riveted, as well as for the complete cylinder assemblies. We hope that these will be in situ by mid- to late autumn. An appeal for funding for the wheels - drivers and pony truck assemblies - is under way, and a new Wheel Appeal leaflet, aimed at the membership of the SVR, is on the stocks and will be ready for distribution early in the New Year. A separate bank account has been set up specifically for the Wheel Appeal, and at the time of writing the balance is approximately £10,000: a good start, but leaving us with about £140,000 to raise in order to see the job through. It is never advisable to make predictions about completion dates, but we hope very much to have a wheeled chassis by early 2014: fingers crossed all round! Once the wheels are on the home straight, we will start to appeal in earnest for funds for the motion, boiler and firebox. Finally, I hope that as many of you as possible will be able to attend the second Annual General Meeting, which is being held at Kidderminster Railway Museum on the afternoon of Saturday 31st March 2012, starting at 2.00 p.m.. We can promise you a lively afternoon, with plenty to talk about, and an opportunity to put your own questions, and make your own suggestions, to the Committee. You will also have the chance to re-elect us, or otherwise, as you think fit! In regard to the Committee, we hope to welcome Paul Anderson as a new officer. As Assistant Publicity Officer, Paul will be working with me if we are both elected. He is an ex-BR Nine Elms fireman, with lots of experience of working on the 82XXX class out of Waterloo (he loved them), and has a fund of interesting stories about his years on the footplate. He also has excellent contacts throughout the heritage railway industry, and I hope that all members present on the day will vote for his co-option on to the Committee. It is difficult to list all those colleagues who have helped us this year, but may I just mention two: John Gupwell, who has demonstrated a quite remarkable ability to sell raffle tickets and generally to be of inestimable help; and Tony Cousins, who has been working away quietly in the background looking for possible sources of grant aid. Thank you, both. May I conclude by wishing you all the very best for the coming year and promising that we will continue to do our very best to ensure that the Riddles Class 3MT tank returns to the land of the living, and to its old stamping ground on the Severn Valley line, as soon as is humanly possible!